Making your nail polish last longer is tricky especially when you have natural nails but are a few tips to extend the life just a tad. Always make sure your nails are clean & dry before apply polish. Always use a base coat, this helps the polish to adhere. Allow polish to COMPLETELY dry and then apply a top coat. After a few days try reapplying a top coat. A thin layer is all thats needed. Also try to keep from hitting your nails up against things and when you type, try to type with the tips of your fingers and not your nails. Typing with the tip of… your nail can crack polish causing it to chip! 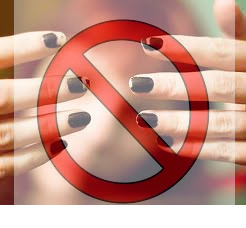 Another option is to try the gel manicure…you can get up to about 2 weeks with no chipping! (This is my favorite…I don’t do regular polish anymore)!